Zlatan Ibrahimovic ignored the predictable boos on his first return to Inter Milan on Wednesday without answering the sceptics who still doubt his ability to finally make a mark in Europe. Wednesday's 0-0 draw in the Champions League Group F opener prompted more questions than answers for both sides, even if Barca shaded the contest in terms of chances and technical ability. Questions also remain over Swede Ibrahimovic, who hopes his pre-season swap deal with Samuel Eto'o can turn him into one of the most feared strikers in the continent after invariably flattering to deceive for Inter in the Champions League. His talents in domestic soccer are undoubted, given he inspired Inter to three Italian titles, and he was full prepared for jeers from parts of the San Siro. "Some whistled, it's normal when you lose a player you did not want to lose," he told reporters. "With a bit of luck I could even have scored." In truth, Ibrahimovic snatched at a good early chance and generally failed to impose himself despite some tidy link-up play. "I'm very happy, in my opinion we have players better than Inter," he said. Eto'o, who scored the opener when Barca beat Manchester United 2-0 to lift the trophy last May, put in a similarly indifferent performance as Ibrahimovic against his former side. "It was difficult for him. But he worked hard for the team and that's why I like Samuel," Inter coach Jose Mourinho told a news conference after refusing to comment on Ibrahimovic's display. Dirk Kuyt struck in first-half stoppage time as Liverpool opened their Champions League campaign with an unconvincing 1-0 victory over Debrecen at Anfield Wednesday. Liverpool were not at their best against the Hungarian champions and will need to improve if they are to advance from Group E which also contains Fiorentina and Olympique Lyon. Only a fine one-handed save by Jose Reina prevented Peter Czvitkovics embarrassing Liverpool in the 30th minute. Fifteen minutes later Kuyt slid in to score from the rebound after keeper Vukasin Poleksic had stopped a shot by Fernando Torres. "We had some chances and didn't take them," Liverpool manager Rafa Benitez told reporters. "We put ourselves under pressure at the end, we couldn't score a second goal. "Hopefully we will see better things in the next game (at Fiorentina on September 29). The most important thing is to start the Champions League group stage with three points." 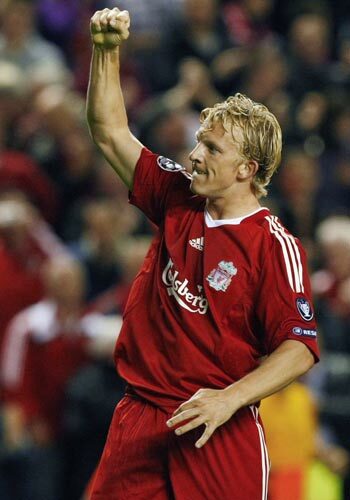 Liverpool began the match slowly before upping the tempo towards the end of the first period, Poleksic producing two saves in as many minutes to frustrate Albert Riera before Kuyt netted. Home captain Steven Gerrard, who was earlier booked for taking a free kick too quickly, was guilty of the miss of the match. The England international was 12 metres from goal and unmarked but scuffed his shot wide of the post. Gerrard also went close with a right-foot volley which went narrowly over the crossbar. Debrecen played well and created several chances without finding the finishing touch. Coach Andras Herczeg said: "We did our best and our performance gives us confidence for our next match (at home to Lyon)." Arsenal's Eduardo da Silva, playing two days after his diving ban was lifted on appeal, celebrated his reprieve by scoring a late winner in a dramatic 3-2 Champions League win at Standard Liege on Wednesday. The Brazilian-born Croatia striker netted from close range with nine minutes to go, three minutes after Thomas Vermaelen had levelled for the Londoners. It meant Eduardo went from villain to hero because he was also at fault for Standard's first goal as the Belgians went 2-0 up inside five minutes. Eduardo, sidelined for a year after breaking his leg in February 2008, had been due to sit out his team's Group H opener after being suspended for two games for deceiving the referee when he won a penalty in a qualifying tie against Celtic. The ban, which infuriated Arsenal coach Arsene Wenger and focussed the spotlight on diving, was lifted by European soccer's ruling body UEFA on Monday. "When you are a big club you cannot accept such a defeat so it was important to come back and win tonight," Wenger told reporters. "We were caught cold by a Standard team that came out firing. It could happen to anyone but to come back and win showed a great team." Brazilian duo Luis Fabiano and Renato scored the goals to give Sevilla a 2-0 win over Champions League debutants Unirea Urziceni in Group G on Wednesday. Renato laid on the opener for Fabiano just before the break and midway through the second half Fabiano's header was glanced in by Renato. The Romanian champions, managed by former Chelsea midfielder Dan Petrescu, were well organised in defence and restricted their hosts to few sights of goal in the first half, despite Sevilla dominating possession. Fabiano stung keeper Giedrius Arlauskis's hands with a free kick and had another close-range shot saved. Unirea were undone in the last move of the half. Renato broke down the left and pulled his cross back to the edge of the area, from where Fabiano finished with a first-time shot into the corner. "Sevilla have some great players and I believe that today I have seen the best striker in the world in Luis Fabiano," said Petrescu. "I haven't seen a player do what he can do in a long time." There was little change after the restart until the 70th minute. Substitute Alvaro Negredo had just had a shot saved when Fabiano's header from a corner was nodded in by Renato at the far post. Having been sturdy in defence, Unirea offered little going forward as they were forced to open up and chase the game. Rangers stunned VfB Stuttgart with an equaliser from Madjid Bougherra late in the second half to draw 1-1 in their Champions League Group G match on Wednesday. Russian Pavel Pogrebnyak slotted home to give Stuttgart the lead on 18 minutes, after Brazilian-born Cacau took advantage of a deflected Sasha Papac clearance to race forward and feed the striker inside the box. Stuttgart dominated possession and could have added another through Cacau, a Germany international, when he fired into the side netting. Rangers, who had failed to create a single scoring chance in the first half, came out more aggressive in the second but it was Cacau who missed the best early chance when he struck from 18 metres only to see his shot sail over the bar. The hosts thought they had done enough to win, gradually surrendering valuable space in midfield and allowing the Scots to become increasingly threatening. Stuttgart, in the same group as Rangers on both of their previous Champions League appearances, were punished for their passive second-half play when Algeria international Bougherra combined well with Jerome Rothen to fire home the equaliser in the 77th minute. Rangers turned up the heat after the goal and could have won in the final minutes. Steven Naismith's shot was blocked by keeper Jens Lehmann and Steven Davis hit the post, with the German keeper well beaten, a minute from time. Olympiakos Piraeus celebrated the arrival of new coach Zico with a 1-0 win over AZ Alkmaar in their Champions League Group H opener Wednesday. Vassilis Torosidis headed home Jaouad Zairi's cross in the 79th minute as Brazilian Zico, named as coach just hours before the match, watched from the stands while interim coach Bozidar Bandovic guided the Greek champions to a home victory. Olympiakos, who parted company with coach Temuri Ketsbaia on the eve of the match, were missing some key players through injury and snatched the three points despite a lethargic display. "I'm not that interested in the fact that I scored, I was more interested in us winning the game. The win will boost our morale," Torosidis told reporters. "The last two months have been a bad period for us but it has been everybody's fault, not just the coach's. "This will help our confidence but there are still five more games to go." Both teams began cautiously, but the visitors had the first sight of goal when Moussa Dembele broke down the right and crossed for Maarten Martens, who somehow scooped the ball over from close range. Torosidis crossed for Diogo as the hosts replied but the Brazilian forward was beaten to the ball by AZ defender Niklas Moisander. The right flank looked the most likely source of a goal for the hosts with Zairi a constant threat. 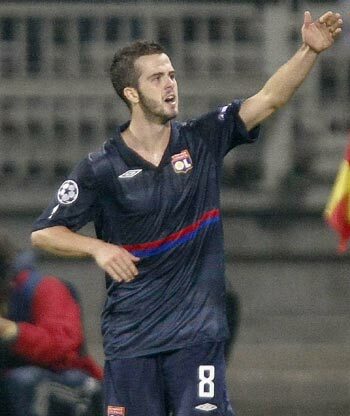 A late goal by Miralem Pjanic helped Olympique Lyon beat 10-man Fiorentina 1-0 in their opening Champions League Group E match Wednesday. Fiorentina were always up against it after striker Alberto Gilardino was sent off on the stroke of halftime for elbowing midfielder Jeremy Toulalan. Lyon, though, could not break through until the 76th minute when Bosnia midfielder Pjanic struck from close range. "We had to go for it and it was not easy," Lyon coach Claude Puel told reporters. "The referee (Dutchman Pieter Vink) didn't help us by letting them commit many fouls in midfield that stopped us from creating chances." "We needed to stay calm and we managed to do that. There is a strength, a spirit in that team I like, even if it would have been better to score one more goal." Fiorentina coach Cesare Prandelli said: "There's no need to comment on Gilardino's sending off. He had no intention to hurt and was just going for the ball. "It's a pity because until it happened we were looking good." Dynamo Kiev scored three goals within 15 minutes Wednesday to sweep to a 3-1 victory over Russian champions Rubin Kazan in their opening Group F Champions League clash. Rubin scored the only goal before the interval through an Alejandro Dominguez free-kick in the 25th minute as Dynamo struggled to impose themselves on the match. The arrival of Tiberiu Ghioane and Oleh Gusev off the substitutes' bench lifted Dynamo's performance and Ayila Yussuf finally opened the scoring for the home team in the 71st minute, heading a Gusev corner into the net. Brazilian Gerson Magrao scored his first goal for Dynamo after a cross from Ghioane through Andriy Shevchenko eight minutes later. Gusev scored the third five minutes from time. Shevchenko, Ukraine's most famous striker and a former European Footballer of the Year, was playing his first game in European competition for Dynamo since his free transfer switch from Chelsea. "We needed to change things around and Gusev became our trump card despite fitness problems," coach Valeriy Gazaev told reporters. "Our substitutions had a great impact and reinforced our attack with speed and quality."